"Using excellent basic research methods, (MRI) is a quite effective organization in providing important information on industrial related processes. One very good example that helped our integrated LTCC program was the 'characterization and modeling of Camber due to sintering mismatch between individual components." Dept. No. 2, NGK Spark Plug Co., Ltd. Plug Co., Ltd. The anodization kinetics in Ta and Nb capacitors are being considered from a fundamental point defect model. Electrochemical impedance spectroscopy and structural data help elevate the oxide growth as a function of temperature, particle curvature, voltage, etc. Self-consistent models of the behavior are being developed. State-of-the-art transmission electron microscopy techniques are being used to understand and quantify short-range order and processing parameters that induce local crystallization under specific anodization conditions. Degradation and self-healing mechanisms are also being investigated with techniques that quantify valence states and oxygen stoichiometries on a nanometer length scale. Piezoelectric actuators are on the verge of a wide scale automobile application for diesel and gasoline injection. These actuators require high performance piezoelectric ceramics (d33 > 700 pm/V, with Tc ≈ 350°C) made from Pb(Zr,Ti)O3. There is a wide variety of thermochemical reactions that need to be controlled in actuators with Ag-Pd or Cu inner electrodes. Collectively, such interactions influence production yield and long-term performance of the actuators. Time dependent reliability issues are also being studied under various stress conditions, including pulse drive conditions under high temperatures and high relative humidity. Also emerging are thrusts in lead-free piezoelectrics, micromachined high frequency transducers, and piezoelectrics for resonators. Integrated passive and functional components are continually developing areas in packaging. In the Center, we have developed cofirable dielectrics with low temperature cofired ceramics (LTCC) with a variety of permittivities for microwave applications. Methodologies to aid cofiring are also of interest, such as constrained sintering and rate-controlled processes. Application areas for high permittivity, low loss dielectrics with NPO temperature dependence include a variety of microwave filters tunable circuits, and antennas; we also integrate piezoelectric motors into LTCC for optical alignment. Thin film integration is also a major activity, with both passive MEMS devices and embedded capacitors. "(MRI) has a distinguished record of accomplishment in working with its industrial partners to better understand materials and process related phenomena relevant to the multilayer electroceramic industry. I’m excited about the Center's extension into the realm of tantalum and niobium electrolytic capacitors, and I am optimistic that the Center will be able to achieve similarly significant accomplishments in this area. 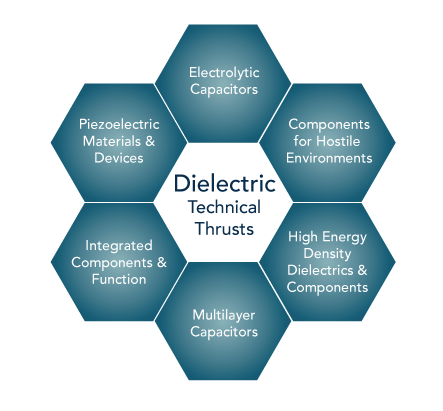 I would strongly encourage other companies that play a part in the electrolytic capacitor industry to consider participation in the Center for Dielectric Studies." Multilayer ceramic capacitors have a very aggressive roadmap over the next ten years. There is a need to understand and predict reliability, while simultaneously enhancing the capacitive volumetric efficiency. Over the next decade, dielectric thickness will reduce to submicron levels ~ 0.3 μm. In other applications, higher voltage requirements are desired for a variety of high permittivity dielectrics in automotive aerospace and display applications. Understanding reliability, conduction, dielectric relaxations, and non-linearities, through developing the key structure-property-process relationships, is an urgent research need. We anticipate that, with some extreme requirements for specific decoupling and band-pass capacitor applications, there will be a move away from characteristics such as X5R, X7R, and a need for application-specific dielectric development. This is anticipated in implantable electronics for the medical industry and in high capacitance decoupling capacitors for the voltage regulator circuit in I.C. packages. Dielectric materials are a critical factor in pulse power and power distribution systems for medical, automotive, and defense applications. There is immediate need for fast-response capacitors with decreased volume, weight, and cost. Energy density, which captures permittivity and dielectric breakdown strength as vital materials parameters, dominates this research challenge. For pulsed power applications, the goal is to develop polymers, oxides, and composites with energy densities between 10 and 30 J/cm3, operating voltages greater than 1 kV, and msec-μsec charge/discharge times, with reliable operation near dielectric breakdown. For power electronics applications, the goal is to achieve high ripple currents at high temperatures. High temperature, voltage, and stress degrade component performance. Current R&D focuses on new high temperature relaxor dielectrics with relative permittivity ~ 15,000 at 300°C. Excellent voltage saturation characteristics have also been determined. Piezoelectrics with new structures and chemistries have been investigated to obtain high performance at temperatures between 350°C and 1000°C.